At the First Annual Meeting of the Association for the Study of the Cuban Economy (ASCE), I presented a paper titled “International Tourism in Cuba: An Economic Development Strategy?” In that paper, and in subsequent articles (Espino 1993; 1994), I documented the performance of the tourist industry in the 1980s and early 1990s and estimated the sector’s impact on the Cuban economy. In this paper I will update the analysis to 1999, focusing on the ten years that encompass the special period. The paper is divided into three parts: the first part traces the development of the industry; the second part presents and analyzes indicators of tourist activity in the island; and the third part estimates the economic impact of international tourism on Cuba. The paper ends with some concluding remarks. Tourism in pre-1959 Cuba was a major industry and a primary source of hard currency and employment. In 1957, 347,508 foreigners visited Cuba (Truslow 1950; Grupo Cubano de Investigaciones Económicas 1963; Martín Fernández 1988) and tourist receipts amounted to 62.1 million pesos. In that year, hard currency earnings from tourism were greater than those from the tobacco industry and were only surpassed by earnings from the sugar industry (Banco Nacional de Cuba, 1960b, 1960c). 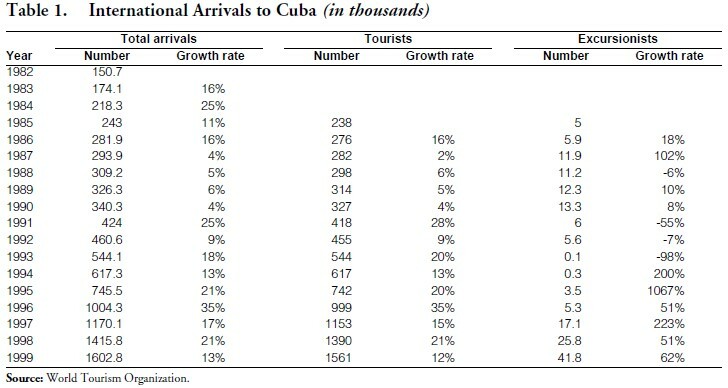 During the 1950s, Cuba’s share of the Caribbean tourism market ranged between 18 and 21 percent (Espino 1994; 1993; 1991) and most visitors to the island were from the United States. In spite of prodigious efforts, the tourist business succumbed to uncertainty, inconvenience and unpleasantness (p. 202). … People stopped going to Cuba because the island no longer was a pleasure to viisit. Vacationers wanted to relax, and they had their choice of sunny beaches and gambling casinos elsewhere in the Caribbean. Escalating antagonism over the issues of sovereignty, property, and ideology threatened and then ruptured U.S.-Cuban relations. By the time Castro nationalized U.S. property in October of 1960, most North Americans already had scratched Cuba off their list off desirable travel destinations (p. 203). International tourism all but disappeared from the island. During the 1960s and 1970s no major investment in tourism was undertaken. The vast tourism infrastructure built up during the pre-revolutionary years was left for the use of Cuban citizens and international guests from socialist and other friendly nations, or simply abandoned. Some sixteen hotels were closed down and hotel capacity was reduced by 50 percent (Ayala Castro 1991, p. 15). After years of neglect, the government timidly started to promote international tourism in the mid-1970s. Visitors from non-socialist nations started trickling back. In 1974, 8,400 visitors from capitalist countries visited Cuba. In 1976, recognizing Cuba’s comparative advantage as a vacation spot and the potential benefits to be derived from international tourism, the Cuban government created the Instituto Nacional de Turismo (INTUR). INTUR became the agency primarily responsible for developing policy for both national and international tourism, as well as for collecting data on tourist arrivals and tourist receipts. The late 1970s also saw an increase in the island’s imports from Western nations and growth in the hard currency trade deficit. Cuba’s hard currency debt grew in tune with the trade deficit. By 1982, debt obligations to the West were estimated at $3 billion, and in August of that year the Banco Nacional de Cuba announced its inability to meet debt repayment obligations and called for a debt rescheduling (Turits 1987, p. 165). It the midst of this external sector crisis, in February 1982 Cuba enacted Law Decree No. 50, which allowed restricted foreign investment in the island for the first time since the triumph of the Revolution. Under Law Decree No. 50, mixed operations with up to 49 percent foreign ownership were allowed to operate in Cuba (Pérez-López 1985). …lots of opportunities are emerging. Important opportunities, very important opportunities! That is in the form of mixed enterprises, due to the fact that tourism is a very special endeavor, it is not nickel, it is not sugar, it is not the manufacturing industry; there exist international organizations that possess capital, and possess, on top of that, experience and, above all, possess the tourist markets (Castro 1988). By the mid-1980s, the external sector crisis had intensified. Soviet subsidies in the form of oil re-exports, which had since the 1970’s contributed to finance Cuba’s trade deficit (Pérez-López 1988), started to disappear. In 1986, Cuba defaulted on its hard currency debt. The Cuban government, in sharp contrast to trends in the Soviet Union, at the time experimenting with glasnost and perestroika, embarked in a counter-reform, idealistic economic development program named the “Rectification of Errors and Negative Tendencies” (Mesa-Lago 2000). Along with the abolishment of free farmers markets, a return to moral incentives and the elimination of many of the market-based reforms made during the late 1970s and early 1980s, the rectification process added emphasis on the development of the international tourism industry. A new development strategy was based on a food program with unrealistic targets that optimistically foresaw that in five years the island would be self-sufficient in food and generate a surplus for export; biotechnology was also promoted as a source of exports and to make Cuba a world power in that field; the only sensible development strategy was the expansion of foreign tourism enclaves (Mesa-Lago 2000, p.11). To accommodate this expansion of foreign tourism, Cuba turned to foreign investment in earnest. In 1987, another tourism development agency, Cubanacán, S.A., was created. The main task assigned to Cubanacán was the attraction of foreign capital. In 1990, two hotels constructed and operated under joint venture agreements opened their doors in Varadero (Espino 1994): the Sol Palmeras Hotel, a joint venture between Cubanacán and the Spanish conglomerate Grupo Sol; and the Tuxpán Hotel, a joint venture between Cubanacán and German interests, managed by the German company LTI International Hotels (Cabrera 1991). Also by 1990 a smaller corporation, Gaviota, S.A., with ties to the military, operated in Cuba and engaged in joint ventures with foreign capital (Espino 1994). Cuba’s rejection of market-oriented economic reforms, at the same time that it steps up promotion of incoming foreign investment, has given rise to a curious phenomenon: the proliferation of economic enclaves subject to capitalist rules—“islands of capitalism”— within a centrally planned economy—“an ocean of socialism” (Pérez-López 1994, p.190). To engage tourism with such low defenses (prior to Rectification) …because the defenses were being lowered, there were no antibodies, we had a sort of AIDS. The technocrats and bureaucrats suffered from and transmitted a sort of ideological AIDS, something like AIDS that was destroying our revolutionary defenses. Now that we are strengthening our defenses, can we succeed or not? Or are we going to let them buy us for four dollars? Or is it that anyone can come and buy us for four dollars and corrupt us? With our defenses well strengthened, as we are strengthening them now, and with the capacity of our people, their integrity, their virtues, I am sure that we will be able to be good hosts to as many tourists as are necessary (Castro 1987). To further isolate international tourism from Cuban society, tourism was to be promoted in enclaves where, as much as possible, tourists would be segregated from Cuban society. The growing dichotomy was not lost on the average Cuban citizen, and the government tourism policy soon began to be referred to as “tourism apartheid.” But the official policy did not succeed in immunizing society from the “evils” of international tourism. By 1990, while it was still illegal for Cuban citizens to hold foreign currency, there existed a de facto dollarization of the Cuban economy, crime had increased, and prostitutes (jineteras), were rampant in the streets of Havana. The late 1980s saw a rapid expansion of the international tourism sector. Tourist arrivals from capitalist nations increased from 101.5 thousands in 1982 to 310.3 thousands in 1990, while gross revenues from tourism increased from $61.1 million in 1982 to $310 million in 1990. In spite of the impressive performance of the international tourism sector, in 1986 the Cuban economy entered a deep crisis from which it has yet to emerge. The disappearance of the socialist bloc and Soviet subsidies, as well as the counterreform policies of rectification, caused the worst economic downturn of Cuba’s history (Mesa-Lago 2000; Roca 1991; Ritter 1988). As has been mentioned above, in an attempt to address the crisis, Cuban authorities announced, in 1990, the start of “the special period in time of peace,” an economic adjustment program. The following year the Fourth Communist Party Congress ratified the plan and spelled out its main components previously alluded to, including (a) a food (Plan Alimentario) and energy import substitution program; (b) the promotion of key traditional exports, such as sugar, as well as new exports, in particular tourism and biotechnology; (c) the encouragement of foreign capital; and (d) some decentralization and moderate reforms in the management of enterprises (Ritter 1994). During the early years of the special period, Cuban authorities concentrated on expanding the export sector (Mesa-Lago 2000). Rapidly becoming Cuba’s main export industry, tourism was to play a key role. In 1992 the Cuban Constitution was amended. The changes included the recognition and protection of private foreign property, an inducement to attract more foreign capital. By 1993 deteriorating economic conditions forced the Cuban government to embark on a number of market reforms (Mesa-Lago 2000). In 1993 the dollar was decriminalized. The most reliable indicator of international tourism activity is the number of foreign travelers arriving in a given country. Though the tourism industry uses various definitions of what constitutes a traveler or a tourist, the international community has accepted a standard definition recommended by the United Nations Conference on International Travel (World Tourism Organization 1981). The United Nation defines a visitor as “any person visiting a country other than that in which he has his usual place of residence, for any reason other than following an occupation remunerated from within the country visited.” Visitors are classified as either tourists or excursionists. A tourist is defined as a visitor staying at least twenty four hours in the country visited whose purpose in making the journey can be classified as (a) leisure (recreation, holiday, health, study, religion, or sport); (b) business; (c) family; (d) mission; or (e) meeting. An excursionist or day visitor is a visitor staying less than twenty-four hours, such as a sea cruise traveler. In accord with international guidelines, the Cuban government collects data on international visitors. One series is compiled by the Dirección de Immigración y Extranjería and includes all arrivals at the border. This series is published by the World Tourism Organization and by the Caribbean Tourism Organization. MINTUR also compiles data on visitors who arrive in the country through travel agencies and/or who stay in international tourism accommodations. All sources point to the rapid growth of international visitors in the 1990s. In 1999, for example, 1,602,791 visitors arrived in Cuba, almost five times as many as the 326,300 that visited in 1989. Growth rates during the 1990s, which averaged approximately 18 percent per annum, outpaced those of the 1980s, which averaged about 12 percent per annum. Arrivals seem to have accelerated in the later part of the decade, growing at an average annual rate of 21.2% annual increase since 1995, compared to an annual average of 13.8% in the early 1990s (see Table 1). The vast majority of visitors to Cuba in the 1990s have been tourists, that is, visitors who stayed in the island for longer than twenty-four hours. Very few excursionists visited the island during this period, for example only 41.8 thousand in 1999, although their number increased rapidly during the end of the 1990s (see Table 1). The percentage of excursionists among all visitors in 1999, 2.6, percent, was lower than the 3.8 percent recorded in the late 1980s and early 1990s. The tourist/excursionist breakdown that prevails in Cuba in the 1990s is quite different from that in pre-revolutionary Cuba and from the pattern in most of the Caribbean. During the 1950s, a major portion of the tourists traveling to Cuba were excursionists: 90,000 in 1958, 22 percent of total foreign arrivals. The low number of excursionists today can be attributed to the island’s exclusion from the seacruise industry as a consequence of the U.S. trade embargo. 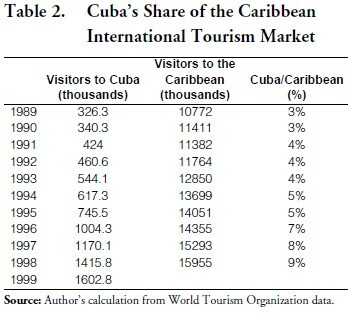 Cuba’s share of Caribbean tourism increased during the 1990s, from an average of 3 percent during the 1980s to about 8.9 percent in 1998 (see Table 2). Cuba’s share, however, is still less than half of what it was during the 1950s. It is unlikely that Cuba’s share of the Caribbean tourism market will reach pre-revolutionary levels as long as the U.S. trade embargo and travel restrictions remains in effect. First, U.S. citizens are prohibited from traveling to Cuba for pleasure. This denies Cuba access to the U.S. travel market, though the U.S. is its “natural partner.” The United States is, in fact, the principal source of tourists to the Caribbean area, though its predominance in the Caribbean market has been declining. In 1998, the U.S. supplied 48 percent of all visitors to the Caribbean, down from around 60% during the 1980s (Espino 1994). Second, as long as the embargo remains in place, Cuba will continue to be left out of the lucrative Caribbean sea-cruise industry. The U.S. embargo prohibits cruises based in the U.S. from including Cuba in their itineraries. U.S. policy restricting pleasure and business travel to Cuba has forced Cuba to seek alternative markets. During the 1990s, Canada generated the largest number of tourists visiting Cuba. In 1999, 276,346 Canadians tourists traveled to the island, 17% of the total number of visitors that year. During 1999, 55 percent of all tourist arrivals in Cuba were Europeans, with Germany, Italy and Spain the largest European suppliers of tourists to Cuba. In 1999, 182,159 Germans, 160,843 Italians and 146,978 Spaniards visited Cuba as tourists; together these three European countries accounted for 20% of all visitors to Cuba in 1999 (Table 3). In the 1990s, Cuba was able to profit from a strong general growth in European travel to the Caribbean region, although its performance with regard to attracting tourists from individual countries was spotty. Cuba’s share of total European tourists to the Caribbean increased from 10 percent in 1989 to 16 percent in 1997; however, Cuba’s share of the German Caribbean travel market has steadily declined from an average of 38 percent in the late 1980s, to an average of 29 percent in the early 1990s and to an average of 20 percent in the late 1990s. Cuba seems to be also losing market share for Spanish tourists to the Caribbean; Cuba’s share averaged 60 percent in the late 1980s, increased to 81 percent in the early 1990s, but fell to 58 percent in the late 1990s and to 50 percent in 1999. With regard to its three largest European suppliers of tourists, only with respect to Italy has Cuba been able to increase its share of the Caribbean market, from average of 33 percent in the late 1980s to 51 percent in the late 1990s. Cuba has been able to compensate for lost of market share among its top suppliers by diversifying to other European countries. In recent years Cuba has been attracting an increasing share of tourists from France and the U.K and the Netherlands, who traditionally have preferred to vacation in their former Caribbean colonies. Among Latin American countries, Mexico, Argentina, Colombia, Venezuela and Chile are the major suppliers of tourists to Cuba. Among these, only with respect to Colombia has Cuba been able to increase its share of the Caribbean market (Table 4). In spite of travel restrictions, the U.S. remains a major supplier of visitors to Cuba. 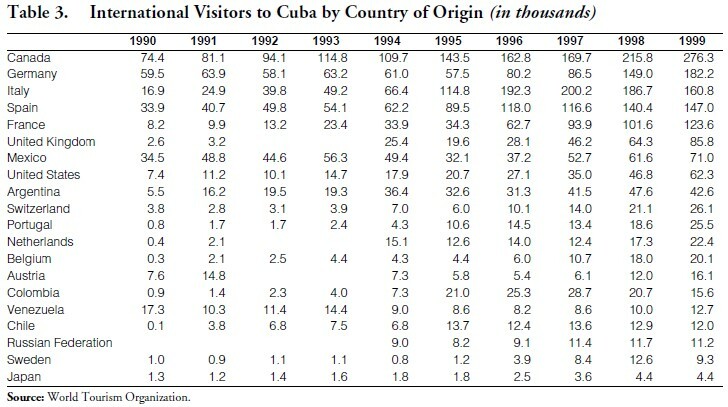 While the WTO statistics shows that 62,345 visitors from the United States arrived in Cuba in 1999 (see Table 3), Cuban officials have alluded that this figure represents visitors considered as U.S. citizens and that in addition, “over 100,000” Cuban-Americans visited the island (Rice 2000). Others have estimate that 153,000 U.S. citizens legally visited the island in 1999, while an additional 28,000 traveled in violation of U.S. law (Amberg 2000). Combining both categories makes the United States at least the third largest supplier of visitors to Cuba, rivaling Germany for second place. Since the mid-1980s, Cuba has targeted the international tourism infrastructure as a priority investment area. Rooms available for international tourism doubled during the 1990s, from the 12.9 thousand in 1990 to an estimated 32.3 thousand in 1999 (Table 5). Cuba’s tourism development plans calls for an ambitious expansion of rooms in eight priority geographic areas: La Habana, Varadero, Jardines del Rey, Norte de Camagüey, “litoral norte holguinero,” Santiago de Cuba, “costa sur central” and Los Canarreos (MINTUR 2000). Despite efforts at diversifying the supply of tourim facilities, the majority of hotel rooms — 66 percent — are still concentrated in Ciudad Habana and Varadero. Of the 9,006 new hotel rooms added since 1994, 2,627 were added in Habana and 4,094 in Varadero. Varadero’s share of total rooms in the island increased from 31 percent in 1994 to 35 percent in 1999. Presently, 189 hotels operate in Cuba (MINTUR 2000). Most independent research agree that the quality mix of these hotels is lower than of others in competing Caribbean destinations, though they have been improving (Godínez 1998). In 1998, only 7.1 percent of hotels in Cuba had a quality rating of five stars; 30 percent of four stars; and 66 percent were ranked as either 2 or 3 stars (Godínez 1998, p.69). Official sources claim that new construction and expansions have improved this product mix, and that currently 64% of all rooms are in four and five stars hotels. The expansion of hotel capacity in the 1990s occurred in spite of low occupancy rates. Hotel occupancy has fluctuated during the second half of the 1990s from 54 percent in 1997, to 61.2 percent in 1998, and down to 56.5 in 1999 (CEPAL 1999; CTO 2000). During 1999, occupancy rates averaged under 50 percent from May to October and were at their highest during February, when they reached 74.5 percent (CTO 2000). In spite of this excess capacity, plans for new construction are driven by a forecast of 5 to 7 million tourists by the year 2010 (Rice 2000; Pérez-Mok and García 2000). To accommodate these tourists, Cuba plans to add 50,961 to 88,519 new hotel rooms in the island. A contingency forecast foreseeing the lifting of the U.S. embargo and travel restrictions to Cuba, would bring in an additional 5 million tourists and create the need for 136,321 new rooms (Fletcher 2000; Pérez-Mok and García 2000). Fulfillment of these ambitious expansion plans hinges to a large extent on Cuba’s ability to attract foreign investment to finance hotel and motel construction. At the start of the year 2000, Cuba’s Tourism Ministry claimed that 900 million dollars of foreign capital had been invested in the industry through 26 joint venture firms (MINTUR 2000); 25 of these were identified as hotel joint ventures. Fifty of the island’s 189 hotels, with 15,390 rooms, are operated by foreign firms. The fastest growing region in terms of new construction and foreign investment is the Jardines del Rey and the area in the north coast of Cuba, stretching from the town of Caibarién in the province of Villa Clara to the province of Camagüey. The area encompasses a number of barrier islands, including Cayo Coco, Cayo Santa María and Cayo Guillermo (MINTUR 2000; Fletcher 2000). The economic importance of international tourism lies in its ability to generate benefits for the host country. Tourism can improve the balance of payments, generate government revenue, enhance income, create jobs and promote economic growth and development. International tourism receipts are defined by the WTO as follows: expenditures of international inbound visitors, including their payments to national carriers for international transport; this should also include any other prepayments made for goods and services received in the destination country (WTO 1995). • Package travel, package holidays and package tours. • Recreation, culture and sporting activities. Unlike international arrivals, which are relatively easy to account for, receipts from international visitors are hard to measure. Though attempts are being made to standardize the methodology countries around the world use to estimate these receipts, estimating techniques vary from country to country. This makes a meaningful comparison of visitors receipts across countries difficult. In the case of Cuba, analysis of visitors receipts is complicated by a number of factors. First, data on two distinct series of receipts are collected and reported by Cuba (Martín Fernández 1988). The first series reports visitors’ expenditures on lodging, food, entertainment, travel within the country and the like, but following recommendations of the International Monetary Fund (IMF) for the treatment of tourist receipts in the balance of payments, excludes international travel fares. The second series is much broader and refers to gross revenues; it includes receipts from activities related to international tourism, such as international communications and aviation. These two series are often reported interchangeably, leading to confusion and at times overestimates (or underestimates) of growth rate when the gross revenue series is compared to the expenditures series. Secondly, I suspect that both the coverage and methodology used to estimate the tourist receipts series have changed significantly from the late 1980s, when INTUR was the only player in the tourism sector, through the 1990s with the diversification of tourism agencies and the creation of MINTUR, increased participation of foreign capital, the decriminalization of dollar holding, and the increased participation of foreign capital in the industry. In recent years both official sources and international agencies have been publishing what seem to be historically revised series (see Table 6). 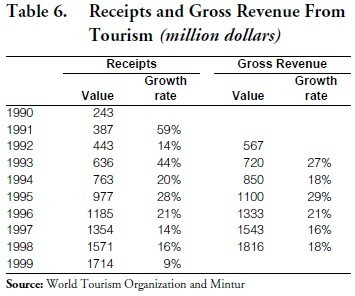 Both of the revised series indicate strong growth in international tourism receipts during the 1990s. Visitors expenditures (WTO receipts series) grew from $443 million in 1992 to $1,714 million in 1999. Gross revenues from tourism were reported at $567 million in 1992 and increased to $1,816 million in 1998. From 1992 to 1995, tourism receipts grew at a faster rate than arrivals; this is reflected in average receipts per visitor, which increased from $962 in 1990 to $1,300 in 1995 (see Table 7). Since 1995, however, average receipts per visitor have been declining and stood at $1,069 in 1999. The fluctuations in the average receipts per visitor series might be due to a number of factors, among them change in expenditures per tourist, increases/decreases in prices and inconsistencies in the tourism receipt series. Because international tourism represents the consumption of domestic goods and services by foreigners, it is considered an export activity. A country’s tourist exports are recorded for the most part in the services (or invisible) category of the balance of payments accounts. Of the major expenditure categories, only in the shopping category are some of the expenditures considered goods and not services. While estimated and recorded separately, all components of tourism receipts, including international fares accruing to the country, should be recorded as credits in the balance of payment accounts. The impact of tourist receipts on the balance of payments is one of the important economic benefits derived from international tourism. The importance of tourist receipts in Cuba’s balance of payments has increased steadily in the 1980s and 1990s. In 1987, tourism receipts were Cuba’s third largest source of hard currency, excluding oil re-exports (Banco Nacional de Cuba 1988, p. 10). In 1994, tourist exports surpassed sugar exports, making international tourism the top export industry in Cuba. Table 8 compares Cuba’s tourist receipts to total exports of goods and services. Since 1994, export earnings from tourism have been, on average, about 39 percent of total hard currency earnings; in 1998 the ratio of gross revenues to total goods and services exports was 43 percent, compared to 22 percent in 1992. Gross revenue from tourism made up 66 percent of Cuba’s service export in 1998, making tourism by far the most important source of service exports in the island. In 1998, gross revenues from tourism exceeded total merchandise exports. The importance of tourism in Cuba’s balance of payments reflects, to a large extent, the poor performance of Cuba’s other export industries. Gross receipts from tourism measures the contribution of tourism to the overall balance of payments. However, when assessing the contribution of export industries to the generation of foreign exchange, a more accurate measure would be net earnings, that is, gross earnings minus the associated imports required to generate these earnings. In tourism the latter is known as the import component, and includes such items as: the cost of imported goods and services used by tourists; the foreign exchange cost of capital investment; payments that leave Cuba in the form of profits, interest payments royalties, management fees, payment to foreign travel agents, and so on; and the cost of overseas training of service personnel. It is hard to ascertain the exact value of Cuba’s tourist import component. In 1990, a Cuban source citing INTUR studies reported that between 23.0 and 64.9 percent of the cost of providing goods and services used by tourists and up to 50 percent of the cost of capital investment in the tourism sector was in hard currency (Canovas Rada 1990, p. 5). Another Cuban researcher calculated that the import component was, on average, between 30 and 38 percent (Ayala Castro 1991, p. 23). In 1996, a Cuban official was cited in Granma, stating that $500 million in imports had been required in the tourism sector (Lee 1998). Since tourist gross revenue for that year reported at $1,350 million, the tourist import component can be estimated at 37 percent. For that same year, the import component for the total export sector had been cited at 54 percent (Lee 1997). Reducing the import component in tourism and in the rest of the export sector has been stated as one of the goals of Cuban economic policies. In spite of efforts made towards this goal, only modest improvements have been reported (Ministerio de Economía y Planificación 2000). A major economic benefit of international tourism is that it generates government revenues. Direct and indirect revenues derived from tourism include aircraft landing fees, airport departure taxes, hotel occupancy taxes, sales tax on tourist purchases, import duties on goods and services used by tourists, corporate taxes and profit repatriation taxes and other licenses and fees. Revenues generated by international tourism allows the host nation to export a portion of its tax burden. The portion of government revenues contributed by foreign visitors in Caribbean countries is estimated to be quite high, ranging from 20 percent in Saint Lucia to 62 percent in the Bahamas (Caribbean Tourist Research and Development Centre 1987, p. 11). It is hard to ascertain the impact of tourism on government revenues in Cuba. While the bulk of tourism goods and services are supplied by governmental entities or foreign interests, the market reforms of the mid-1990s created a small private sector that supplies services to tourism. Four sources of government revenues from tourism can then be identified: (a) those derived from official entities providing tourism services; (b) those derived from taxes, licenses and fees imposed on foreign corporations; (c) revenues derived from taxes, licenses and fees on the private sector supplying goods and services to the tourism industry; and (d) taxes and fees paid directly by tourists. The logical method for estimating total government revenues from tourism generated by official entities would be net revenues from tourism (gross revenue minus the import component). From this, however, one would have to subtract the domestic cost of supplying tourist goods and services. Official figures on gross revenue, however, seem to include tourist revenues from the other three sources, though it is impossible to ascertain what exactly is included. The actual portion of the state budget that is financed by revenues generated by international tourism is also hard to estimate. It is probably a substantial proportion, and one of the primary benefits of tourism to Cuba. In 1994 it was reported that a third of net revenues from tourism were used for healthcare and education. Spending by tourists directly injects foreign funds into the local economy, creating income and employment for those who sell their goods and services to tourists. 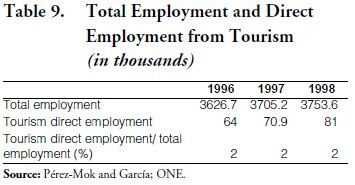 The tourism industry in Cuba directly employed 81,000 workers in 1998 (see Table 9). This represents 2% of the Cuban labor force. 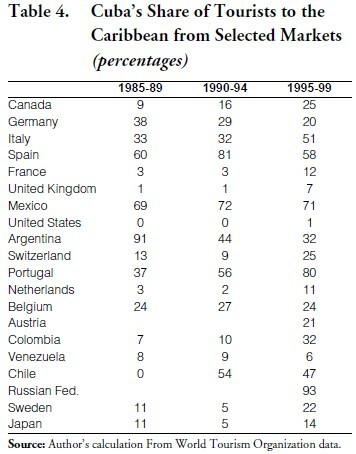 This percentage has remained constant since 1996, the first year for which such data are available. Tourist spending has more than a direct impact, however. Those who gain income from it in turn purchase other goods and services. As spending circulates through the economy, a multiplier effect is created, generating more income and jobs. The total impact of tourist spending on the local economy is a combination of direct and indirect (induced) effects. It is calculated by multiplying tourist expenditures by a tourist income and/or employment multiplier. The value of the multiplier depends on the portion of income that leaks out of the local economy at each round of circulation. These leakages include payments for import of raw materials, rent and profits paid to nonresidents, and savings by residents. The larger and more diversified the economy in question, the lower the leakages and the larger the value of the multiplier (Espino 1994). Estimated values of the tourist income multiplier for small island economies in the Caribbean range from 0.58 for the British Virgin Islands to 1.58 for Jamaica; for other Caribbean island nations the estimated tourist income multipliers are: Cayman Islands, 0.65; Bahamas, 0.78; Antigua, 0.88; Bermuda, 1.03; and Dominica, 1.20 (Archer 1982). The differences in these estimates result, in part, from different methodologies underlying their calculation. Making a number of assumptions, the value of the tourism multiplier for Cuba has been estimated to be in the range of 0.74 to 0.84, one of the lowest values in the literature (Espino, 1994). This low value results primarily from Cuba’s high propensity to import from both tourism receipts and income as a whole. The current value of the Cuban tourism multiplier remains low. Though a small reduction has been reported in the import component of the economy at large and of the tourism sector, these are more than counter-balanced by leakeages due to taxes. The expansionary effect of the multiplier is also affected by supply constraints. The multiplier concept rests on the premise that demand stimulates supply, but the Cuban economy, in spite of the market reforms of the mid-1990s, does not facilitate this process. The multiplier effect for tourist expenditures is further curtailed by continuing government policies designed to keep the tourism sector separate from the Cuban economy. The total impact of tourism expenditures on the Cuban economy is probably not much larger than the direct income and employment that these expenditures create. The analysis of the Cuban tourism sector during the special period does not change significantly the conclusions reached almost a decade ago. While Cuba’s tourism sector will continue to post strong growth, strong growth in an export sector will not by itself promote economic growth and development in an entire nation (Bryden 1973; Griffith 1989). The primary economic benefit that Cuba currently derives from tourism is that it generates hard currency and revenues to finance both foreign and domestic deficits. This seems to be the main motivation behind Cuba’s tourism policy. The economic impact of tourism on the island’s national income and employment is still very small, both in absolute terms and in relation to the size of the national economy. This is due to two factors: (1) the low value of the tourism income multiplier; and (2) constraints on supply. If international tourism is to become a vehicle for Cuba’s future economic development, it must first become a leading generator of income and employment. For this to happen, in turn, the value of the tourism multiplier must increase—that is, Cuba must reduce its imports in all sectors. Moreover, effective linkages must be established with other sectors of the Cuban economy, in particular agriculture, services, and retailing. This entails both abandoning the enclave mode and engaging in further market liberalization. The current policy of keeping the tourism sector separate from the rest of the economy hinders both the expansionary effect of the income multiplier and discourages linkages between tourism and other industries. The absence of free markets further constraints the multiplier effect. Unless government policy changes, Cuba will continue to forgo the potential economic benefits from international tourism.